Flow cytometric analysis of Jurkat cells, treated with U0126 (10uM, 2hr) (blue) or TPA (200uM, 30 min; green) using Phospho-PLCγ1 (Ser1248) (D25A9) Rabbit mAb (PE Conjugate) (solid lines) or concentration-matched Rabbit (DA1E) mAb IgG XP® Isotype Control (PE Conjugate) #5742 (dashed lines). 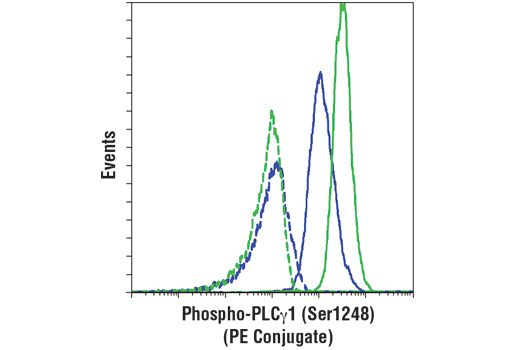 Phospho-PLCγ1 (Ser1248) (D25A9) Rabbit mAb (PE Conjugate) recognizes endogenous levels of PLCγ1 protein only when phosphorylated at Ser1248. Monoclonal antibody is produced by immunizing animals with a synthetic peptide corresponding to residues surrounding Ser1248 of human PLCγ1 protein.